I’m here. Last night, I managed to throw up all my meds…my Cushings meds, my new pill to enhance my appetite, my turkey, my rx canned dog food, and this Epakitin powder. Mama said it was a massive amount, as vomits go. But I promptly wanted to gobble it back up, and Ainsley wanted to help. We were thwarted though. An uneventful night…slept in my usual place, which the past few weeks isn’t on the bed, but a pile of clothes the hoomans have thoughtfully left piled by the side of the bed. Went the hoomans woke up at 5, they were a little concerned to see my bowl of water still full. But then I waddled in there and drank all the water all up. In my patented laying down position. Why stand when you can sit, and why sit when you can lay, right? it’s a soldier’s motto. Then I went downstairs, went outside. And me and Ainsley launched a flurry of auditory salvos at a Golden walking across the street. I’m certain the neighbors must appreciate our efforts at aural warnings before 6 am. Then I came in, ate a treat, and ate my cushings meds in my turkey. Hooman gave me a couple of extra slices of turkey for good measure. Here’s hoping we all have a good day. Please high tail it to quality emergency pet care and get that other issue checked out. Emergency is of the essence. I’m glad you had a good night. I woke up thinking about you and I echo Trisha’s comment above that you need immediate care, Angus. Hopefully you were just on overload. Mama is home, trip to vet, some not great news, very rich canned food, new meds , geez – how much can a guy stand. Hopefully life will be back organized and you will get everything lined up. Try eating small amounts often! You play it right you can have a buffet all day. Keep up your strength Sarge. Oh dear, Angus…we hope you are feeling right as rain this morning. We also pray that the special food and powder and all the efforts of your peeps work to give you the longest time with us that you can manage. We’ve lost too many good Scots lately! Cushex Drops is an all natural remedy to relieve the symptoms of Cushing’s Disease in dogs and cats by improving adrenal and pituitary gland functions, balancing blood pressure and blood sugar levels. Today will be a much better day! 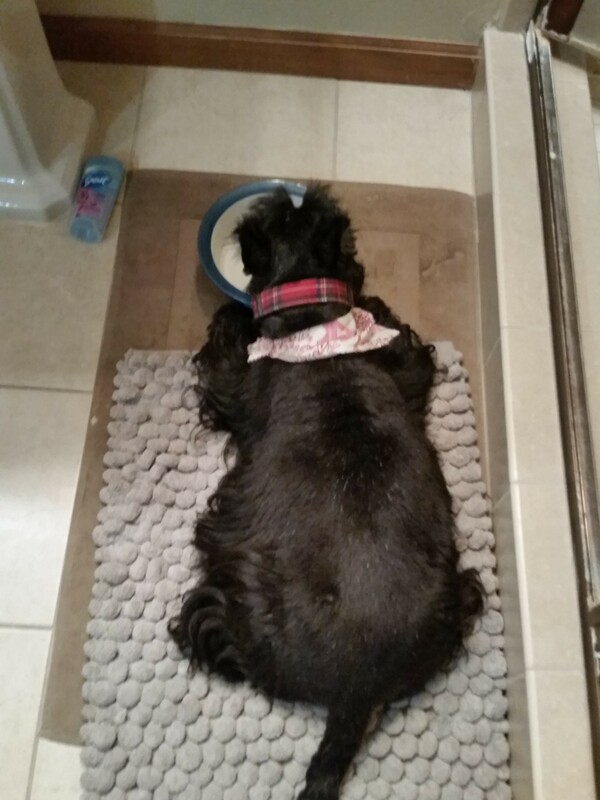 All that denied canned food was too much for your empty tummy so it rebelled in true Scottie fashion. Trick is small, yes small Angus, spoonfuls lots and lots of times (you will like that). As Gary said, it is a good morning!!!!! Take it slow and easy and as Trisha and Sharon said there is emergency for this. ER Pokeys need yachts too, that’s why they build emergency clinics. Keeping your food in you is top priority and hence emergency. Fergus and Guinness have their loving paws around you, me too! Sending you POTP and hugs to you and your peeps. May you feel better and keep eating and the food stays down. Angus, I have long wondered why dogs eat their vomit. Could you ask Ainsley if the is any research? Things aren’t sounding good. When Kyla went downhill, it was like falling off a cliff-it went quickly south. Hi Angus, Edgar sent us over. We’ll keep our paws crossed for you, mate. Hope your food & meds stayed down today. Also hope it was all too much from not eating for 2 days. Sending prayers & healing thoughts your way. 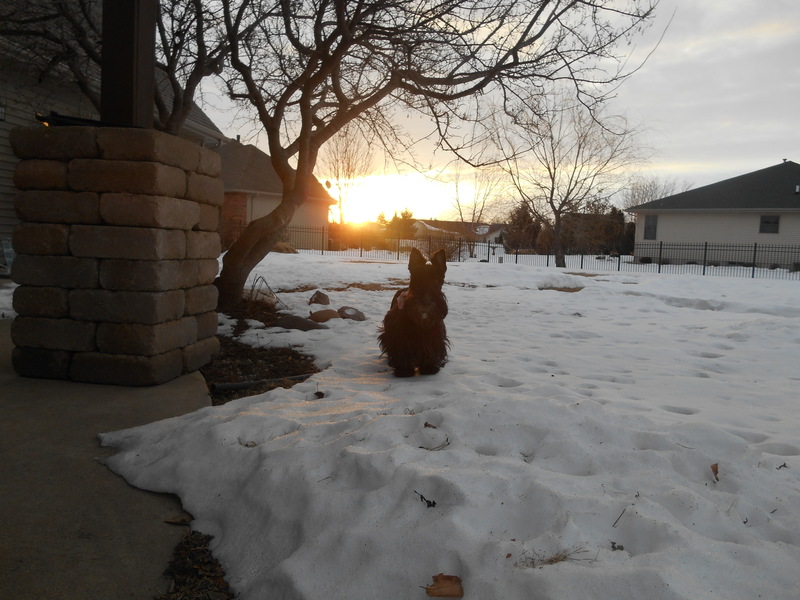 I too am an enemy of Cushings and Lymphoma Angus, although I have no personal knowledge of these Devils I know we have lost way too many Scots to them and vow to support the research to eradicate these takers of life in the name if Angus Fala and many other Scotties!! Yep….you can’t over eat Angus…..bites is healthy…but that nut overeats and up it comes every time, ya gotta go small several times….still gots our POTP going here for you! I’s wif ya on da lyin down – standin (and sittin) are highly overrated. We’re glad to hear you had a good nights sleep & deep morning drink. We are keeping our paws crossed for you. G’day mate, a friend told me you weren’t feeling well, so I’ve popped in to let you know us Blogvillians are thinking of you and hope for the best. Give it hell, Sarge… give it hell! So far so good. Now don’t go wasting any more food, otherwise the Mess Hall is gonna give you less rations.